Not eating food or consuming calories for a time period greater than 8-10 hours. The most popular time period is 16 hours without food. So essentially you are only eating within an 8 hour time window. For example: you break your fast at 10:00am and your last meal is finished by 6:00pm. This is not the only option for intermittent fasting you can fast for an entire day or multiple days if you wanted to go longer. Everyone is different find the rhythm that works best for you. 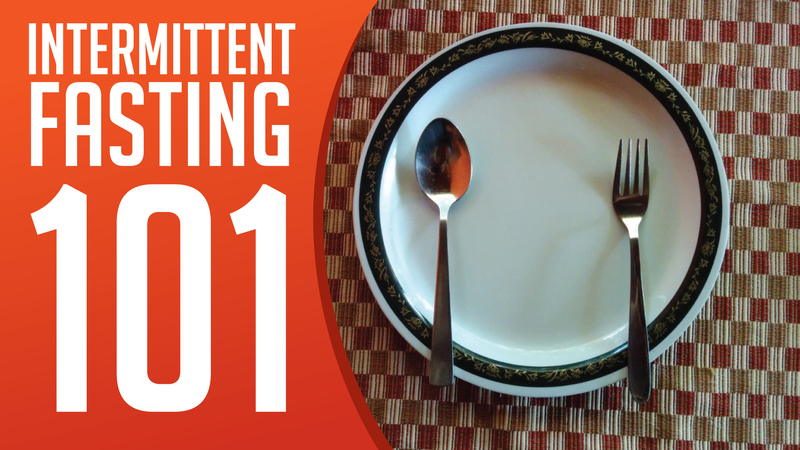 Some major benefits of intermittent fasting are burning fat and weight loss. Others can include greater mental clarity and cognition abilities. There are many studies that show that intermittent fasting causes something called autophagy. Autophagy is your bodies way to kill off or cleanse weaker cells and replace them with newer stronger cells once food is reintroduce into you system. This is most apparent after about 20 hours of fasting. Autophagy also helps with the reduction of inflammation and brain fog. Intermittent fasting studies also show it produces more mitochondria which gives us more energy. 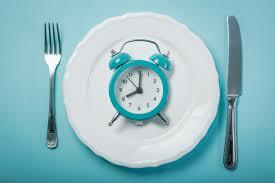 During intermittent fasting you also produce HGH in its natural form and can raise your levels. This can help produce more muscle. HGH also helps with anti aging and longevity benefits. Hangry. This is a real thing especially if you currently eat on a regimented schedule. You can get moody and have some serious hunger cravings. After about 8-10 hours your body burns through all its sugar or glucose and starts to run off fat. Ketosis is when the body is only running off fat. So if you were to workout in a fasted state during ketosis you would burn more fat. Keto diet is extremely popular right now and many people pair intermittent fasting with the diet. During your eating window you can eat whatever you want. But for maximal results breaking your fast with healthy foods will always be your best option. Sticking with whole foods such as lean proteins, leafy greens vegetables, some fruit, and no sugar. Everyone has different goals. Start with your why and base your food consumption off your goal. If your goal is to lose weight and your eating fast food then it’s not going to work. Water is a must. Whatever you consume it should have zero calories. So if you have coffee it has to be black. Once you reintroduce calories the fast is over. What if I combine the Keto Diet with Intermittent fasting? If this falls in line with your goals it can potentially be your best option. Combining Keto and IF would be great for weight loss or maintenance. If you were looking to gain weight it might not be your best solution. Mainly because Keto is a low carb diet. Keto would not be recommended but to actually carb load depending on your sport. In an aerobic event IF can be beneficial. For anaerobic event (like lifting weights) it can be a bad thing. Who intermittent fasting is NOT for? If you are pregnant, have chronic stress or an eating disorder. Let me start by saying i’m not a certified nutritionist or expert in intermittent fasting. My intent of this short blog is to try an answer some basic questions. I hear a lot of people talking about Keto and IF lately. I usually fast once a week on Sunday and some of the results I have seen is great mental clarity and more energy. I have also gone 24 hours without food and it just made me really hungry. At the beginning of those 24 hours I felt good but towards the end it got difficult. Some of the longer benefits are detoxify the body and giving your gut a break. I have also notice a difference in gut health improvement. This also has a lot to do with what I am consuming. At the end of the day IF is a tool just like a squat. It can help you out but you have to do it right and frequently enough to notice a difference.